DOOM: The Board Game is strategy board game of tactical combat for two to five players, based on Bethesda and id Software’s video game of the same name. Featuring two distinct player roles, the game brings the epic battle between elite marines and Hell’s most threatening monsters to the tabletop. 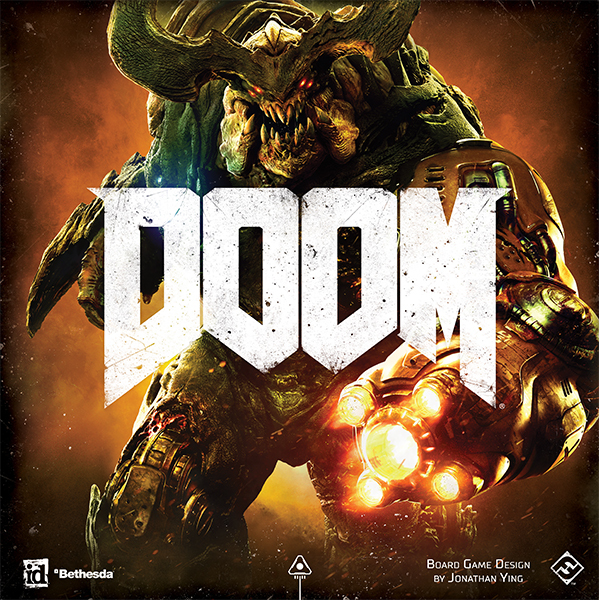 DOOM immerses players in a fierce battle between legions of demons, controlled by one invader player, and a cooperative team of up to four marines. The game guides players through two cohesive operations, during which the marines strive to achieve objectives like restoring power to the Union Aerospace Corporation’s facilities or manning expeditions right down into the pits of Hell. Meanwhile, the invader commands their demons to slaughter the soldiers time and time again in an attempt to protect their fiery domain and destroy all of humanity. Each of the operations is made up of six missions, spanning a variety of UAC stations and the scalding territories of Hell. Each mission takes place on a unique map and provides a set of special objectives for both the invader and marines. The designated objective card indicates a goal for the marines to accomplish, while also providing an exact number of times the demons must kill the marines in order for the invader to crush the operation. In addition to these objectives, the cards also include special rules pertaining to each specific mission, shaping strategy with unique abilities for both sides of the struggle. Alongside the objective card, the setup of each mission is decided by a set of threat, invasion, and event cards. The threat cards describe three different ways in which the invader may summon their demons from the portals across the map: Assault, Horde, and Infestation. The threat card is visible to all players, however, the demons at the invader’s disposal remain concealed from the marines on the hidden invasion card. The invasion card lays out six invasion groups which the invader may summon when the portals are activated, increasing their threat level on the board. 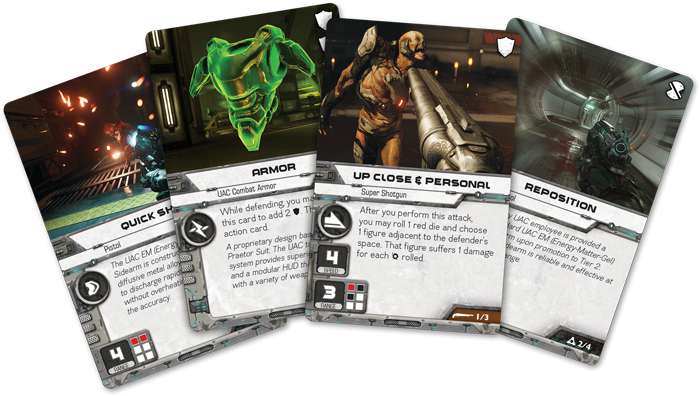 The final step in the invader’s setup of each mission is sorting out the event cards, which make up the invader’s deck of special abilities and defense. Each mission’s carefully selected combination of these three elements makes every play a seamless and unique game experience. After setup, the game proceeds in two alternating phases—status and activation. During the status phase, the invader prepares their newest demons, draws their hand of event cards, and gains Argent Power to spend on special abilities. The status phase also involves filling and shuffling the initiative deck, which has a card for each marine and as many invader initiative cards as the invader has demons. This designates the turn order of the activation phase, so each round is random. 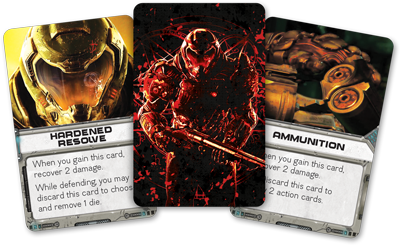 However there are some cards that allow the invader or a marine to modify the order of some initiative cards. The activation phase begins with drawing the top card of the initiative deck. If a marine card is revealed, that marine proceeds with their action, carrying out one main action and then any number of bonus actions. At the end of marine activation, they draw cards from their action deck up to their hand size. If drawing from the initiative deck reveals an invader card, the invader may choose any demon type on the board to activate, gaining movement points equal to the demon’s speed and performing one attack. Play proceeds, alternating between drawing from the initiative deck and activating based on the card shown until the deck is empty, at which point the round begins again. The team of marines is made up of one to four units, each with their own individual class, loadout, and action deck. As a marine, you will choose your class card at the beginning of each mission and keep it throughout the game. 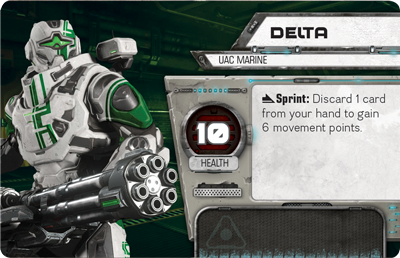 The card will indicate what unique abilities your marine possesses, helping to shape your strategy and the dynamic of your team as a whole. Class abilities range from allowing you to reorder initiative before each activation phase begins to increasing the number of cards you can hold in your hand. You will also begin the game with a standard issue loadout consisting of two weapons. The action cards for these weapons are combined with four core action cards to create a ten-card action deck. You will cycle through this deck as the game progresses, using it to fill your hand and defend against attacks. Each card has either a main action, bonus action, or reaction on it, which you can play out of your hand. In the upper right-hand corner, each card also indicates a level of defense, from no defense to dodging the attack entirely. Whenever your marine becomes the target of an attack, you will flip the top card of your action deck, gaining defense accordingly. Your action deck is not limited to the ten cards you begin with. There are classes you can choose and pickups you can collect in order to expand your deck further. A variety of grenades and heavy weaponry will help you upgrade your deck, adding new attacks, abilities, and defense. Expanding your deck is a surefire way to make your marine a force to be reckoned with, whether they wield a tricky grenade or a savage chainsaw. One player in your game of DOOM will take on the role of the invader, commanding legions of demons across valuable UAC facilities and Hell’s searing landscapes. As the invader, you must summon your host of demons across the mission map, complicating the marines’ objectives and repeatedly wiping them out. The threat and invasion cards given at the beginning of each mission will designate which demons you're able to summon, as well as when and where they can spawn. Your masses of monsters will without a doubt outnumber the marines you’re tasked with dispatching, but the marines can respawn following death, so you’ll want to consider your summoning strategy carefully. The demons at your disposal are listed on your invasion card, each associated with a colored portal. While the blue portal summons less intimidating monsters, with lower health and less powerful attacks, the yellow and red portals will allow you to call upon increasingly more dangerous demons. The invasion card is hidden from the marines, allowing you, the invader, to throw surprise invasion groups their way, further disturbing their progress toward the given objective. Each of the demons you summon will have specific abilities, speed, range, and health listed on their demon card. While many of these abilities can be used at any time, others will require Argent Power to trigger, which can be collected by discarding useful event cards or by summoning an invasion group which includes a certain amount of Argent Power tokens. These tokens are then discarded when used to activate a special ability. When spent at the perfect moment, these tokens can allot you exceptional feats, allowing you to influence the course of marine actions as well as your own. The event cards are drawn during the status phase of the round, during which you may choose to discard up to three in order to gain Argent Power. However, these cards can be very valuable on their own. Not only do they serve as your demons’ own defense, much like the marines’ action deck, but they also have special effects, such as augmenting attacks, improving your defense, or gaining Argent Power tokens. The invader player has an immense amount of power, with massive hordes of demons at their disposal, but the marines still have a couple tricks up their sleeves. Because death is not feared, but embraced in the game, the marines are encouraged to run into each battle with reckless abandon. Death is inevitable, so as a marine, there’s only one thing to do—make sure you take someone down with you. Glory Kills and Telefragging are exceptionally unique attacks that the marines have available, should their demonic enemies lose a significant amount of health or move to the wrong place at the wrong time. Glory Kills may be executed when a demon has been damaged to their stagger value, a number on their card located just below their health. To carry out the kill, a marine must charge into that demon’s space for two movement points, receiving in return two health points as well as a Glory Kill card, which provide still more special abilities. Telefragging, on the other hand, is an action which may be carried out at any time. As long as a demon is standing directly upon a teleporter, a marine may spawn there, whether by respawn or teleporting from another active teleporter, immediately fragging the demon and removing them from the map and the game. 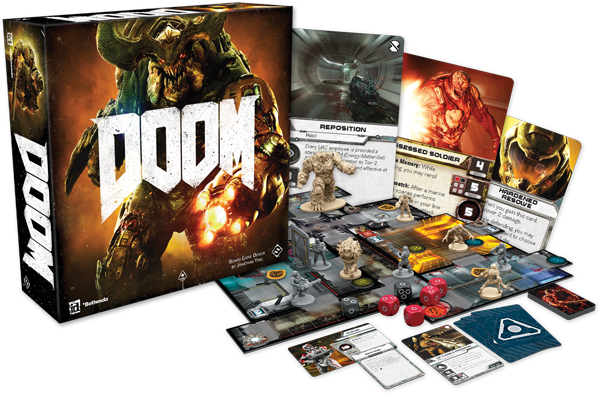 Bring the thrilling experience of Bethesda and id Software’s first person shooter, DOOM, to the tabletop with DOOM: The Board Game. Gear up to take down the hordes of horrific demons as one of the UAC’s heavily-trained marines, or flood the claustrophobic corridors and desolate dunes with a mass of demons as the invader. 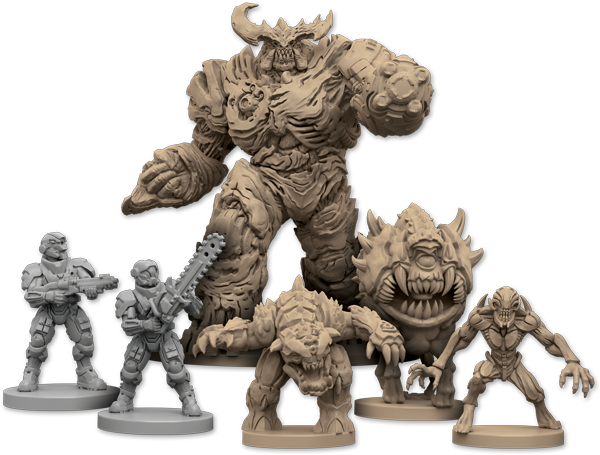 Gather your friends for an exceptional marine-on-demon combat experience in DOOM: The Board Game.